My fiancé and I met while both living in Tucson, Arizona, traveled abroad just a few months into dating, then took a gap year before applying to grad school. He taught English in Istanbul while I hostelled and couchsurfed through Europe, joining him in Turkey for a month or two at a time before re-entering the Schengen Zone. The following fall, we both began graduate school, and criss-crossed the U.S. for three years to sustain a long-distance relationship. Needless to say, travel has been an integral part of our relationship, and one of our favorite things to do together. That doesn’t mean it’s easy, though. We are very different people with different approaches to interacting with the world. While I am happy to go anywhere new—whether it’s a hundred miles from my hometown or several time zones away—he’s more interested in being immersed in cultures and languages wholly different from our own. While I could stroll through museums all day, he favors the uncurated outdoors. While I’m a fan of public transportation, he prefers getting to know a city on foot. While the bustle of a metropolis like New York City or Rome thrills me, it can exhaust him. Even our staunch opinions on carry-on luggage diverge completely: I’m a die-hard fan of my convertible backpack-rollerbag hybrid; he’s a backpacker to the max. We both agree that carry-on is the only way to go, though. Of course, there are things we both enjoy and can agree upon—like acquainting ourselves with the local cuisine over long meals. But sometimes it can be tricky trying to plan travel when accommodating our many divergent wishes. Here are some ways we’ve made it work. Find Destinations That Combine Interests: When we plan trips, we try to take into account the different geographies and activities that interest us both. We both like hiking and kayaking, so rivers and mountains are generally a good bet. If we want to relax, we look for a place that combines greenery (for him) but also space with comfortable outdoor lounging (for me). For instance, on our second trip to Greece, we decided to eschew the islands and head up the eastern part of the mainland. We ended up hiking Mount Olympus—which we both thought was pretty cool, even in the scorching July heat—but also visiting Thessaloniki and admiring the other-worldly rock formations of Meteora, all of which satisfied my desire for urban sightseeing and his for rural tranquility. Play Tour Guide: Sometimes what’s most meaningful is allowing one partner to share places important to them. That’s how we handled our first trip to Greece. My fiance had studied and worked there, so he was excited about showing me around a country he loved. I’d never been to Greece before, and I, the eternal organizer, was happy to relinquish the logistical reins to him. Not only was I able to better understand a place and how it had shaped him, I got a much more local experience traveling with someone who spoke the language and knew the ins and outs of the culture. Take Turns with the Itinerary: When deciding what to do, we tend to prioritize what’s top on the list for each of us. “While I’m in X place, I really want to see Y attraction, but it’s okay to skip Z activity.” The conversation goes from there. One way we do this is by taking turns arranging the day, or even part of the day. For example, when we were in Zagreb, Croatia, I was fascinated by The Museum of Broken Relationships. Although he’s not a huge museum-lover, it was unique enough to keep his attention, and I got my museum fix. Immediately afterward, he was in charge of picking our lunch spot, which was more important to him. Schedule Time Apart: Sometimes what’s better than fretting over an activity your partner might not enjoy is doing that activity on your own. On a recent week in Sweden, he was presenting at a conference. During the daytime hours when he was at the university, I went all over Stockholm doing things he wouldn’t want to do: shopping, museum-hopping, spending time in the more crowded and touristy parts of the city that would bore or frazzle him. When we met up again in the late afternoons, we’d do those things we had prioritized together. Keep an Open Mind: One lesson I’ve learned from nearly six years of partnership with someone so different from me is that opposites attract for a reason. In our relationship, we push each other outside our comfort zones in ways that encourage us to grow, both individually and as a team. Traveling together was one of the first ways we experienced that—it’s a perfect setting for practicing joint decision-making, for confronting obstacles and discomforts together, and for accumulating quirky stories that we’ll be able to laugh about for a long time. 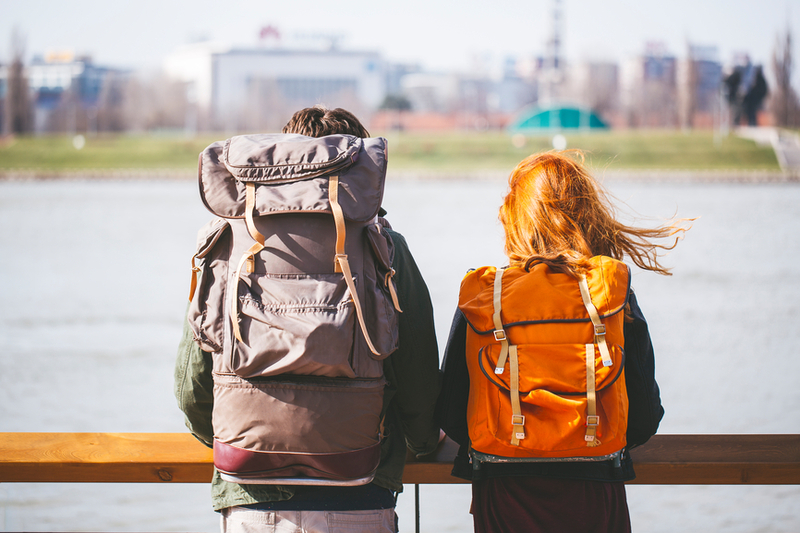 Ultimately, traveling with different tastes is great training in a key component for any relationship: compromise. Sara Button is a writer, editor, and educator based in the Bay Area. Read more of her work at sarambutton.com.